Location: Inside the main entrance on the N side of Fairoak Road. Built in 1857-9 for Cardiff New Cemetery and designed by R.G. Thomas, architect of Newport, in collaboration with T. Waring, Borough Surveyor. Early Decorated style mortuary chapels of snecked rock-faced stone, lighter freestone dressings, and banded slate roof with crested ridge tiles, behind coped gables on moulded kneelers. The block faces E to the cemetery entrance and is a 5-part symmetrical composition with central tower, lower links incorporating gabled covered ways, leading to chapels, Anglican on the N side and non-conformist on the S, the gables of which form the outer elements. The 3-stage tower has a doorway with a single order of shafts and foliage capitals, hood mould with foliage stops to a stilted 2-centred arch, and flanked by open pointed quatrefoils and gabled buttresses. Above is a 3-light window with plate tracery, shafted mullions with foliage capitals, and relieving arch. Another open pointed quatrefoil is to the lower R of the window. Either side of the window are the gabled caps of the buttresses to the sides, behind which are the stone slab broaches where the tower turns octagonal. The upper stage is octagonal with single hooded lights with foliage stops. Buttresses have shaft bases on the offsets but the shafts that were originally carried up to the eaves cornice are all now missing. The moulded cornice has a Lombard frieze. A pyramidal metal spire, replacing the original and taller spire, has an apex cross. The links to the chapel each have tall covered ways, designed to accommodate hearses, under steep gables. The imposts have a single order of shafts, moulded capitals and 2-centred arch with 2 orders of filleted roll moulding. Above the arch is an open pointed trefoil on the L and round trefoil on the R. Flanking the covered way on the L side are 2-light windows with cusped-headed lights and shaft to the central mullion (window on the R side boarded up at the time of inspection). Flanking the N covered way are 2-light windows, obscured by vegetation on the L side, on the R with ogee-headed lights. The chapels project at each end and have 5-light E windows (boarded up at the time of inspection) and angle gabled buttresses, which in the N chapel have attached slender shafts with foliage capitals in the angles between them. The E window of the Anglican chapel has a moulded sill with foliage stops and hood mould with head stops. In the N wall, of 4 unequal bays, is a doorway set back from the E end. This is set within a projecting gabled surround carried up above the eaves and crowned by carved foliage finial, and has low gabled buttresses. The doorway has a single order of nook shafts with foliage capitals and 2-centred arch incorporating a continuous foliage frieze. The hood mould has angel stops. The double boarded door has strap hinges with scrollwork. To the R of the doorway are gabled buttresses and two 2-light windows under hood moulds, while the bay at the W end is blind. The W wall has a wheel window with hood mould and sill band, both with foliage stops. A pointed trefoil is below the apex. The S wall is similar to the N, with blind bay at the W end and two 2-light windows, with the link at the E end. The W side of the link to the N chapel has a window L of the doorway (boarded up at the time of inspection) and external stack to the R. The W side of the tower is similar to the E (but the 2nd stage window was boarded up at the time of inspection). The S link has an external flue L of the doorway but only to eaves level. To the R of the gable is a single-light window. The S chapel is similar to but slightly plainer than the N chapel. Its N wall has two 2-light windows (one boarded up at the time of inspection) and a blind bay at the W end. The W wall has a wheel window with hood mould and sill band, and trefoil below the apex, while the S wall has 2-light windows to the central bays and doorway at the E end. The doorway, in a projecting gabled surround similar to the N chapel, has a single order of nook shafts, moulded capitals and hood mould with head stops. The covered ways incorporate doorways to the chapels and central tower. In the S covered way is a pointed arched doorway (boarded up at the time of inspection) to the chapel and doorway with shouldered lintel to the tower base. The N side has similar openings, with boarded door and strap hinges to the tower base. 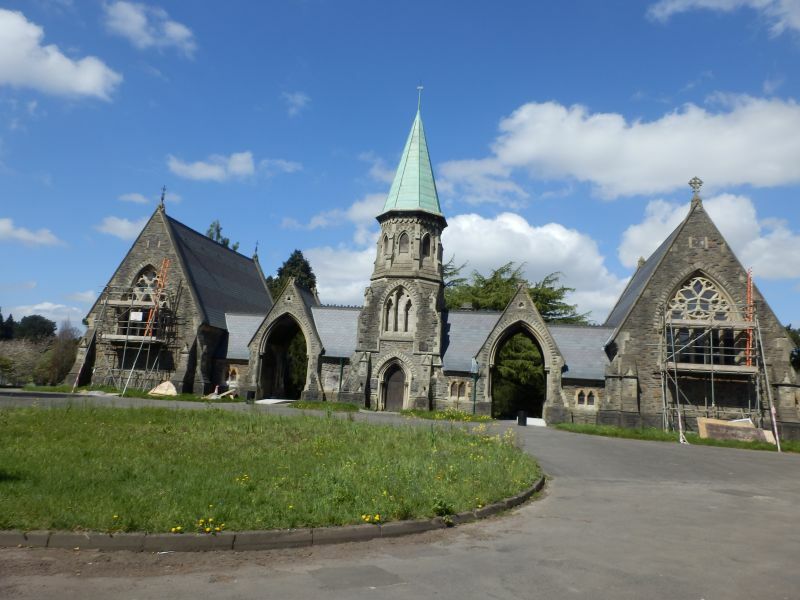 Listed as a striking and original Victorian Gothic composition retaining original detail, and for group value with the gateway and Cemetery House at the finest public cemetery in Wales. At the main entrance to Cathays Cemetery SE of the Anglican and non-conformist chapels.